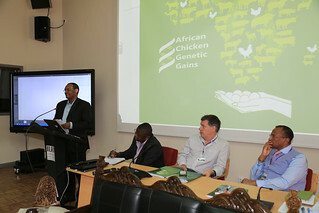 This week, chick geneticists and researchers are meeting in Addis Ababa to set out plans and deliverables for the African Chicken Genetic Gains project. 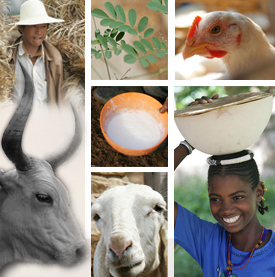 ACGG is a research-for-development partnership project working in Ethiopia, Nigeria and Tanzania. It aims to develop public-private partnerships that will contribute improve chicken productivity to benefit smallholders. The project will test and disseminate improved breeds of chickens likely to suit the needs of farmers in low-input systems. Jimmy Smith, ILRI director general opened the deliberations pointing to the high potentials the project offers: for impact, for capacity development, for strength through partnerships. Representing the Ethiopian government, Fentahun Mengistu director general of the Ethiopian Institute of Agricultral Research (EIAR) also emphasized the potential roles of poultry to help the needy. Speaking for the Bill and Melinda Gates Foundation (BMGF), Donald Nkrumah highlighted the potential of this project to help poor farmers – especially women – generate income. He said that this is one area where women have a comparative advantage. He is also very excited about the potential of the project to catalyze changes beyond the three countries – the improved genetics need to flow out and beyond and into the hands of farmers. He suggested that success in this project will be when poultry industries in the countries have been transformed and national capacities have grown such that ILRI is not needed in implementation. ILRI’s Steve Kemp re-emphasized that ILRI looks to step back from the downstream implementation. The partners will be doing this – and will be supported to do so. He explained that ILRI does however have a strong interest in ways that the approaches and lessons of this project can be replicated and expanded in other projects. He mentioned his keen interest to also draw out the longer term genetic and genomic insights of the project. The first ACGG program management team (PMT) meeting brings together key participants from the three countries as well as other key implementing partners. I am very happy to learn about the take-off of this timely intervention. It will go a long way in alleviating poverty, especially in the rural areas of the project countries. Indeed let’s hope that your wishes be true and that this project helps a lot of smallholder farmers (and yourself Evaristo) to lead the production of well adapted chickens in East and West Africa. Do you have any advice on the way forward for the project teams?